Last Tuesday, history was made with the election of Barack Obama as the first African American man to be president. And, on a more personal note, I became a grandmother for the first time on Thursday night with the birth of my granddaughter, Gabriella, to my son, Brendan, and his wife, Brianna. All is well with Mom and baby and I’ll be happy to share pictures very soon. I feel hope and new beginnings. Even the temperature outside is gentle and hopeful, hovering around 60 degrees last night when we left the hospital. 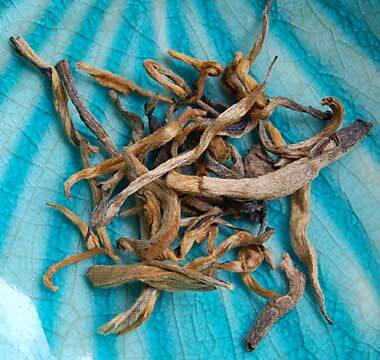 This morning I’ve brewed up a steaming cup of a Golden Tip Yunnan black tea, recently arrived. 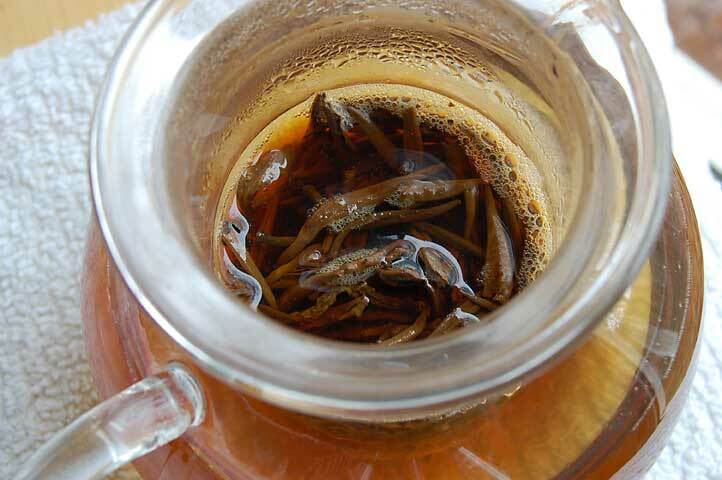 It was a real challenge finding high quality Yunnan black teas back in 2007 but that seems to have resolved in 2008, and there are some wonderful teas coming in. The long dry leaves are soft golden leaf tips with fine white hairs. Many leaves come in leaf sets like the one in my photo. Even though the dry leaf can resemble white tea because of the fine downy hair, this tea is fully processed as a black tea. 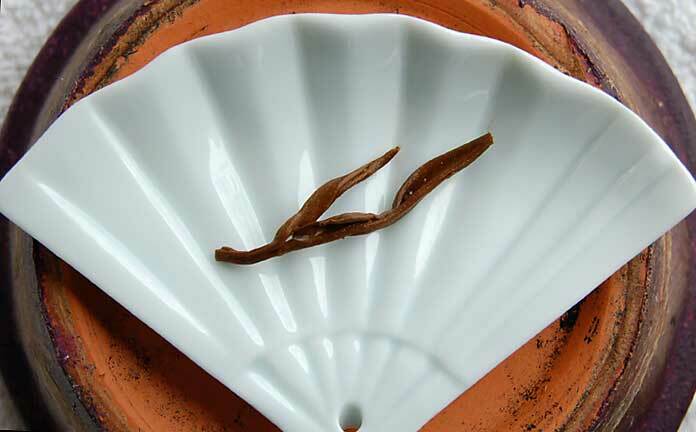 The sage-y white look of a white tea leaf becomes a brownish golden color in a black tea due to the oxidation of the leaf. I steeped the leaves in my little glass teapot for 5 minutes in boiling water. 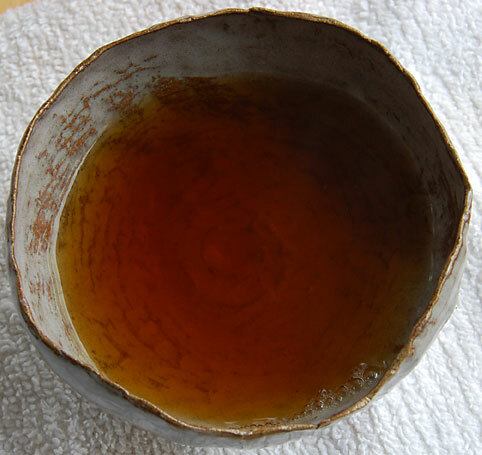 The liquor is a deep rust brown color with a sweet fragrance of fall leaf and earth. Each sip of tea fills my mouth with its full body and notes of peppery spice. It’s very smooth and can be enjoyed with a small amount of milk or cream added. With its natural molasses sweetness, there’s no need to add any sugar. Today will be a full day in my studio with my teacup by my side as I prepare for an arts and crafts show scheduled for November 22nd at Middlesex Community College in Bedford, MA. Of course, there will have to be breaks in my work so I can go over to the hospital and hold a sweet little angel named Ella. This entry was posted in Black Tea, Inspiration, Life Musings, My Studio, Photography, Tea, Uncategorized and tagged Yunnan black tea, Yunnan Golden Tips tea. Thank you so much, Kathi, for your kind words! I am very happy to share my love of tea with others. Glad to hear that my reviews are enjoyed. Congrats, Karen, on becoming a grandma ! Gabriella is a beautiful name, glad to hear that mom and baby are doing well. Congratulations, Karen! There is nothing quite like becoming a grandma for the first time. I love your tea entries so much — I can honestly say I have learned more about tea since coming to your blog than I ever knew. Thanks Kathy, I’m glad to hear that you’re enjoying my tea reviews! Congrats to parents and grandma! I think the little ones connect to our voices and they are listening intently even at 2 days old. Oh, enjoy her as much as possible. You are lucky to have had two bits of such good tidings in one week. I’m waiting to hear how many babies will be names Barack or Obama this year. Thanks Timaree! Yes, it was an amazing week!